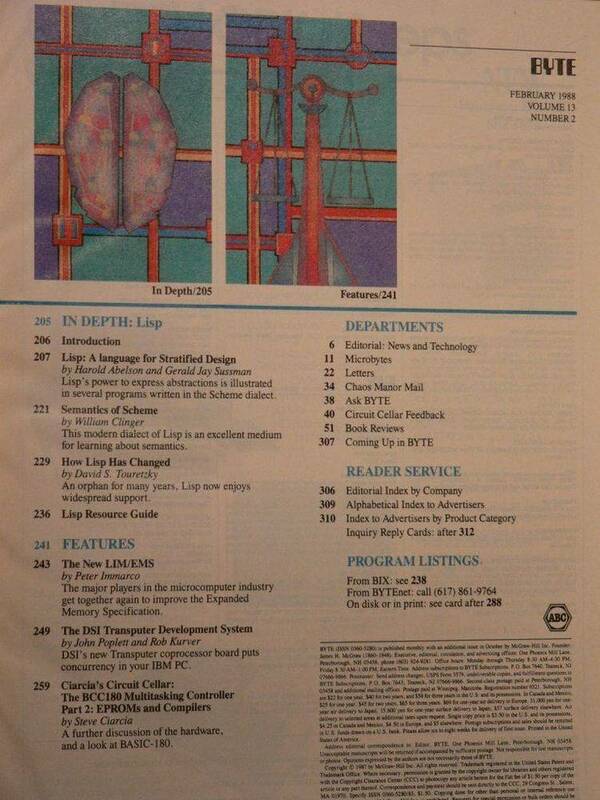 Byte magazine April 1988 benchmarks programs. BYTE Low-leve Benchmarks for IBM PC, XT, AT, and compatibles. and takes the transpose of a matrix. Assumes square matrices. word-wide move is done on even- and odd-byte boundaries. SCFM87.C - 8087 Floating-point library. Used by FLOAT88.C. TEXT.C - Text display benchmark. VIDEO.C - Video support library used by GRAPHICS88.C and TEXT.C. SCHDSEEK.C - Hard disk seek benchmark. Reads raw disk sectors. SCBIGWT.C - Write a 1,000,000-byte file and time the results. SCBIGRD.C - Read a 1,000,000-byte file and time the results. SCRAND.C - Random number generator. SCSW88.C - Two routines for creating a software stopwatch.